NEWBURGH (WABC) -- Three Newburgh residents are facing charges after police say they illegally disposed of a body in Plattekill. 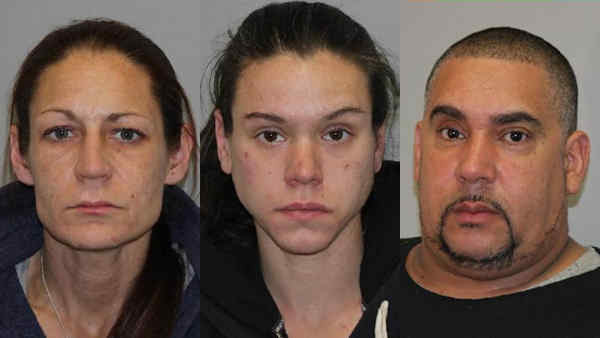 New York State Police at Highland arrested 44-year-old Angel Delgado, 41-year-old Kristen Green and 33-year-old Lauren Romano on Saturday and charged them with concealment of a human corpse and conspiracy. Authorities say that officers called to investigate the death of an unidentified female who was located in a ditch on New Unionville Road around 7 a.m. Friday. The deceased woman was identified as 28-year-old Alexis Scanlon, also of Newburgh. The subsequent investigation revealed that Scanlon died on February 25 while at Deldago's residence. At this point, the death is not considered suspicious, and investigators were awaiting the results of toxicology tests. The City of Newburgh Police Department also assisted with the investigation, which is ongoing. Delgado, Romano and Green were all processed and remanded to the Ulster County Jail in lieu of $5,000 cash or $10,000 bond.